BOUÉ SŒURS 9 Rue de la paix Paris 13 west 56th st. N.Y. Pink changeable taffeta, embroidered pale gray cotton organdie appliqué. Dress in pastel pink and pale gray displaying the color sense and use of lightweight materials that typified Boué Sœurs designs. Color tone and form are reminiscent of 18th century court dress. This example features front edges of the bodice turned back to reveal a pale gray front panel embroidered with small flower motifs, much like a decorative stomacher, and a partial overskirt with substantial gathering at the sides that adds volume. The aim is to create an effect like that of a petticoat visible underneath a robe. 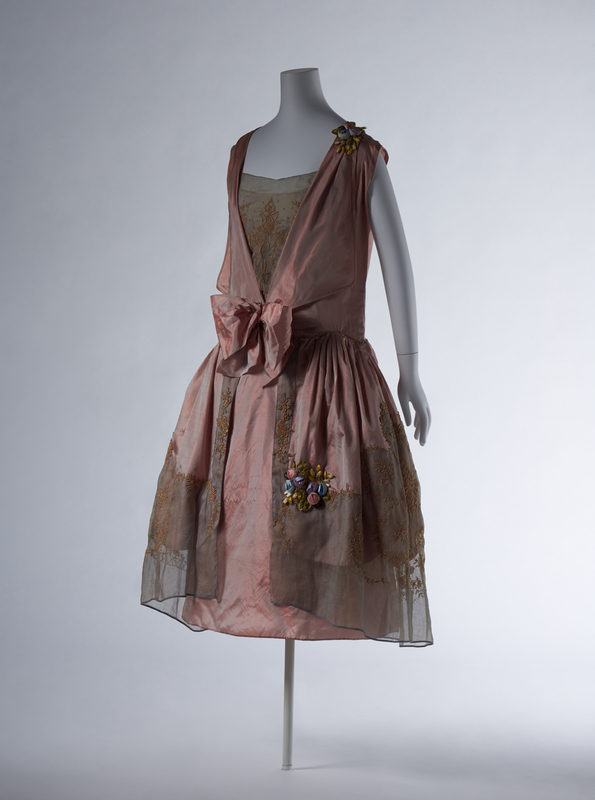 The silk ribbon rosette embellishments are icons of the Boué Sœurs brand. Sylvie, the sister in charge of the creative side of Boué Sœurs, was a frequent visitor to museums, and found inspiration in the costumes of women painted during the 18th century Rococo period. The 1920s saw the emergence of active, dynamic women, including the flapper girl or garçonne phenomenon, and there was a fashion for functional, simple garments with slim silhouettes. In contrast, during this period Boué Sœurs created refined feminine dresses with an elegance produced by painstaking handiwork that won the hearts of women who preferred more traditional beauty.